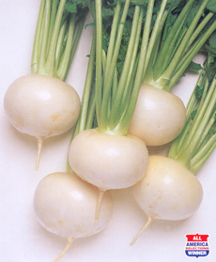 Turnip 蕪菁 | Tainong Seeds Inc.
Grows well under low temperature. 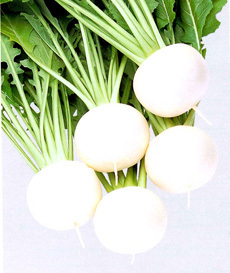 Pure white, tender, perfect globe-shaped root with uniform size. 2~2.5 inches (5 cm) in diameter. Maturity in 40~45 days after sowing. Very early maturity, ~35 days after sowing. Perfect globe shape and very smooth, ~6 cm in diameter. Can harvest root from 6 ~ 15 cm in diameter without risk of getting pithy.